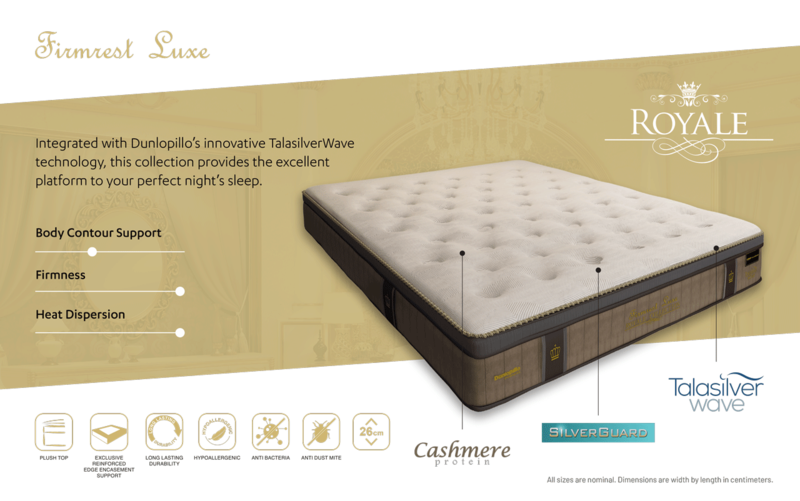 Treat yourself to a Royale mattress and experience true royal indulgence. The Royale collection caters to those that desire luxury in every detail. Boasting an impeccable blend of premium components that provide exceptional comfort, optimal contour support and the finest in fabric innovation, a Royale mattress is carefully crafted with your discerning taste in mind. Nanobionic is a high-tech bio-ceramic coating that transforms body heat into Far Infrared Rays and reflects them back to the body. It regenerates, restores and recharges your body by reducing fatigue, cold feet and cold hands. Purotex capsules probiotics in textiles, this technology reduced the symptoms of allergic reactions by fighting against dust mites and unwanted allergens, leaving you a peaceful night’s sleep. Intense uses innovative ultra-fine, multifilament carbon fibre thread technology to discharge your body from daily static electricity that caused tension and fatigue, allowing deeper and more restful sleep. Sanitized treated mattresses are effectively protected against dust mites, bedbugs, fungi, bacteria, and odour. 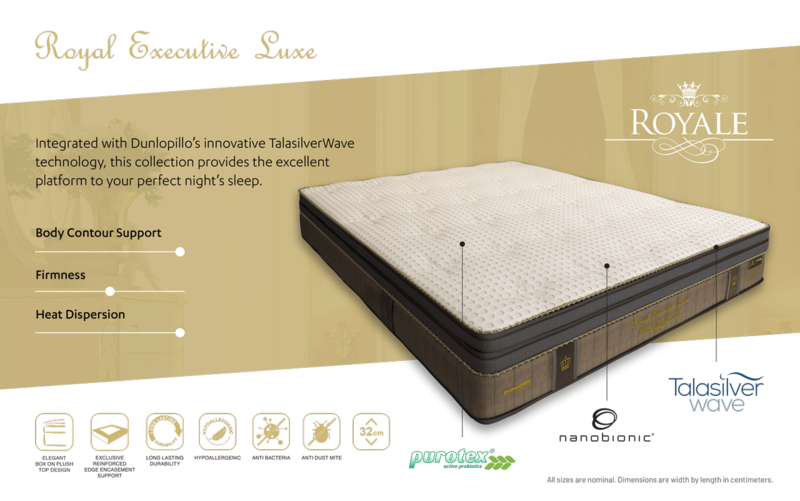 This revolutionary antimicrobial hygiene function ensures fresh and cleanliness in your every sleep. SilverGuard is the top finish of your mattress with nano silver ions to prevent the inhabitation of micro-organisms and bacteria growth, ensuring optimised hygiene and freshness.